- Survey finds wide variation in definition of "local" foods. - Hurdles to local foods include growing season, price and quality/safety concerns. - Demand extends to local foods when dining out. NEW research confirms that interest in locally sourced foods is taking hold among consumers who equate "local" with "fresh" and "healthier" and who want to support their local economy. Still, the definitions of "local" vary widely by age group and were found to encompass national brands, according to a survey commissioned by food industry marketing company Charleston|Orwig. In the survey, 63% of consumers indicated that a national brand can be considered locally sourced based on where its growers/products are located, while 58% believe a national brand is locally sourced when it uses local sources for ingredients and products. About half of the restaurant operators surveyed agreed with both statements, at 55% and 45%, respectively. While 27% of consumers and 19% of operators said a brand can be considered locally sourced because units/sales help the local economy, on the other hand, 21% of operators and 17% of consumers said a national brand can never be considered locally sourced. When asked to define "locally sourced," a majority of consumers responded: "Food or products from within their state." Younger consumers, however, defined "local" as much closer to home — within 5-10 miles. The new survey was inspired by research Charleston|Orwig sponsored in 2012 that found that a majority of consumers had recently purchased locally sourced food. What's interesting is that "local" was a more important consideration than "organic" and was cited as a key driver of sustainability, according to consumers surveyed last fall. "It seems 'locally sourced' is gaining ground around the country and certainly is a frequent topic among our clients and friends in the food industry," said Mark Gale, Charleston|Orwig partner and chief executive officer. "We thought it was important to dig deeper into this trend and the insights from last year's research." The 2013 survey compared priorities between locally sourced food and brand, convenience, availability and cost. Datassential led the research, which surveyed more than 2,700 consumers and 300-plus restaurant and foodservice operators. As much as consumers and operators value locally sourced foods, they identified significant hurdles to purchasing and offering local items, including short growing seasons that limit stocks of fresh produce, price as well as quality and safety concerns. Both groups agreed that food safety is more important than a local source, with operators showing particular concern about food safety. "The research suggests an opportunity for national brands to support chain and franchisee efforts to source some ingredients locally, and national brands can source locally to appeal to consumers and operators who see the benefits of locally sourced but are concerned about safety and availability," Gale said. Gale noted that addressing locally sourced concerns is important for brands because one-third of consumers and one-quarter of operators in the Charleston|Orwig survey identified themselves as brand loyal, while half of consumers and two-thirds of operators said they are "somewhat" brand loyal. The research further noted a correlation between retail purchases of and demand for locally sourced foods when dining out. 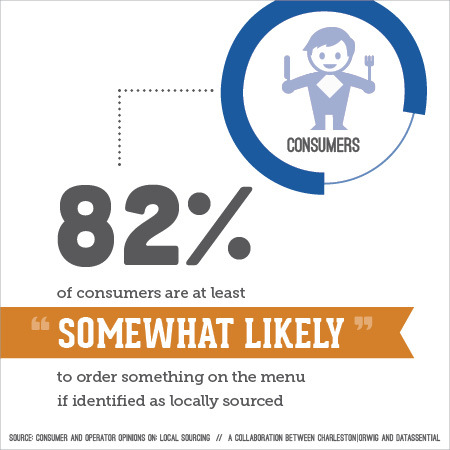 Nearly 50% of consumers surveyed by Datassential who "always" or "usually" purchase locally sourced foods for home use said they also order local foods when eating out. Finding local items on restaurant menus may be difficult, however, because nearly 60% of operators surveyed indicated that they do not include locally sourced or farm-identified items on menus due to seasonal availability and cost issues or safety concerns. Fine and casual dining operators are most likely to offer local or farm-identified items, indicating an opportunity for quick-serve and midscale restaurants to address demand for locally sourced foods, Gale said. Charleston|Orwig, based in Hartland, Wis., is a full-service communications consultant, providing integrated marketing and reputation management to food system clients — from agriculture through processing and distribution to the point of retail.